Now, all the blame does not fall on Trump. We have years of legislative brinksmanship and hostage-taking to thank for this, all of it pioneered by the Republicans in Congress with their government shutdowns and debt-ceiling hijinks. McConnell and Ryan bear heavy loads of blame, as do the House Freedom Caucus, who often defy their own leadership, and the so-called "Hastert Rule" which allows Republican hard-liners to keep popular bills off the House floor. And White House Chief of Staff John Kelly, who is supposed to be keeping chaos at bay, seems to have actually been sowing chaos. But Trump has also messed this up, torpedoing deals in progress. The infamous "shithole" meeting wasn't just a moment where the President singled out black-skinned immigrants as undesirable. It's also a meeting where the President unilaterally destroyed a bipartisan immigration deal that would have moved the funding bill forward. The White House has been disputing the particular foul word the President used, but not his refusal to accept African and Haitian immigrants or his sudden decision to rip up a deal that was close to being made. If you want to know why the government shut down, that meeting is the key. The President of the United States ripped up a deal and offered nothing in its place. That's when the wheels came off. John Kelly is also to blame for sabotaging that deal. Senators Graham and Durbin were scheduled for a meeting with the President about the deal they'd been working out, and walked into a room unexpectedly filled with anti-immigration figures who had no real reason to be there, like Tom Cotton. That only happens if the Chief of Staff permits it, or causes it. None of this should be a surprise. Trump's business career is littered with examples of him changing deals or tearing them up after the fact. Think of the many building contractors he's stiffed, waiting until they'd done the contracted work and then not living up to his half of the contract. And think of his multiple bankruptcies, in which he borrowed vast sums of money, didn't pay it back, and then tried to renegotiate his debts so that he wouldn't have to pay in full. (Now, bankruptcies happen and we have bankruptcy laws for a reason, but the sheer number of Trump's is revealing.) This is why Trump hasn't actually put up a building in a couple of decades, as opposed to entering agreements to put his name on buildings other people create; Trump can't get the funding for his own building projects, because he's known for not sticking to his deals. The many stories about stiffing contractors suggests that Trump doesn't see business in the both-sides-win, let's-get-to-yes way that most successful businessmen and dealmakers do. He sees business as a zero-sum, I win-you-lose proposition about dominating the other party and making them accept his terms. That is much closer to the mindset of swindlers and racketeers, who look to extract everything they can without contributing anything to the deal. It's pretty clear that Trump sees business as about beating the other guy. But that mindset encourages people not to deal with you. In fact, it makes it irrational to deal with you. Why give concessions to someone who won't give any back? This mindset is also clear from the way Trump talks about virtually every treaty or trade agreement the United States has, complaining that they are "terrible deals" and talking about blowing them up. He doesn't think about what America gets back from those deals. He just threatens to blow them up, hoping to extract extra concessions without giving up anything in exchange. No foreign government is actually going to do that, of course. But Trump's whole career has been about trying to get something for nothing. Trump the deal-breaker has been on display for the last week. First he blows up the close-to-finished deal that Durbin and Graham were trying to finalize. Then, in the opposite of normal negotiating behavior, he kept demanding more and more without giving anything in return. The way it's supposed to work when you get close to a deal is that each side trades a little bit more until they have a bargain. It's what you do when you buy a house, or a used car. And usually what you do in that situation is offer small concessions in order to get other concessions back. You do the sidewalk repairs the city inspector wants and I'll throw you some money toward closing costs. You come up a little on price and I'll throw in the washer and dryer. What you never do is increase your demands when you're close to a deal. If we're five hundred bucks apart on price, I don't suddenly increase my ask by another thousand dollars. I don't suddenly demand that you pay my closing costs AND throw in your washer and dryer. Of course not. But Trump does. There was a deal in process and, two days before the deadline, Trump blew it up, apparently expecting to get more. That wasn't just moving the goalposts. It was increasing the ask. The Democrats were willing to trade some things in order to keep 800,000 kids from being deported, including other immigration concessions. Then Trump said that wasn't enough, and essentially that he wanted Dem votes to avoid a shutdown without giving them anything on the Dreamers. 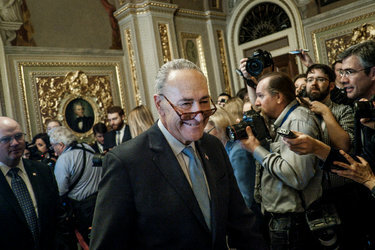 Oddly, the Democrats were not eager to go along with a deal where they were getting less. Trump even threatened to reduce his offer even more, tweeting his opinion that CHIP should be taken out of the bill. Fortunately, that did not happen. But it sure would not have helped. Then Trump spends ninety minutes personally negotiating with Chuck Schumer and got an offer of funding for his ridiculous border wall in exchange for not deporting the Dreamers. Then John Kelly calls Schumer to retract the offer. This is not getting to yes. This is actively, doggedly, moving toward no at every opportunity. Now the Republicans say they refuse to negotiate about the Dreamers at all until the Dems cave on the continuing resolution. So they're saying the Democrats have to give concessions before even asking for things. Demanding the other side cave is not negotiation. I have no idea how long this shutdown lasts. It could be over Monday afternoon. It could stretch into February. It may end in a compromise. It may end with the Democrats caving. It may end with the Republicans melting down. I really don't know, and I'd be a fool to make a prediction. But there are two real possibilities that should go into the mix. It would not surprise me if Senate and House eventually make a deal without Trump and send it to him to sign. He isn't helping negotiations. They might hash this through without him. It would also not surprise me if Trump increases his demands at some point, either demanding more concessions from the Democrats or taking back part of the offer already on the table. That would be a mistake, but it would be one of Trump's favorite kinds of mistake. Quiz master: "What has tusks, big floppy ears and black and white stripes?" Contestant: "Gosh I don't know." Quiz master: " An elephant. I was lying about the stripes." The best most fantastic genius analysis I have seen on this. Republicans have held CHIP (legal US born kids -9 million) hostage for 5 months. They really really do not want any final immigration deal to retire DACA for good. For the GOP, issues like immigration, abortion, border security, climate change, guns, religious "freedom" are gifts for perpetual partisan lies/demagoguery, not for resolution. Serious national issues are rehashed, rerun, exploited, election after election to fire up their base. Republicans cannot govern, aside from serving the rich, because they believe in government as a means to stoke division, controversy and crisis, not unity and progress. If a win means Donald making Putin happy and twisting the US into nots, Trump/Putin have won. Trump has even more select paymasters than the usual craven Repyblican gov-destroyer. It may be that a bloodbath is gathering in financial markets for another "fiscal cliff" battle over the debt ceiling, which could be hit anytime between February and April, but I am a little surprised that we had an unnecessary government shutdown and that stock investors seem to have shrugged it off. I chalk it up to the soft bigotry of low expectations, I guess. Man, that phrase may have been the only good thing W ever came up with, even if he misapplied it. I think from now on it after this experience you describe so well, it might be "ignore the clown doing his troll thing in front of the curtain"? Especially with 2018 campaigns needing to be started? Why is this man grinning in this picture? walked to the Senate floorafter a meeting with his party on Monday. P.S. Interesting fact check: it would be political suicide to do anything nasty to "the Dreamers". Even some of the 1/3 that still give Trump approval must not agree with him on that. I looked at his tweets last night, they were blatantly demagoguing some crap along the lines of how all Dems want to do is let in more illegal immigrants, which is not what anyone else is talking about. It's a straw man game he plays to draw attention back to his campaign memes when things get too complex for him. I think they are all starting to realize the "it's like negotiating with jello" thing because there is no there there, he doesn't even understand what they are doing in Congress, doesn't have the attention span, needs to go back to his own campaign memes. Kelly has a heckuva job. 3. Both sides know better than to negotiate with President Trump. Removing him from the equation, thereby diminishing the influence of senior adviser and anti-immigrant hardliner Stephen Miller, should make a deal possible. The great dealmaker has been sent out to pasture (or to Davos, if you prefer). Trump was exposed as a non-player, a hazard to dealmaking. That’s quite a blow to his brand. I just saw evidence of that live on MSNBC! Anchor was interviewing Rep. Tom Barret (R) of the Freedom Caucus live. He was basically mildly dissing Trump about immigration in general. Upon various challenges from her, he said he didn't agree with their (the White House's) messaging attacking Dems about how they are now responsible for illegal immigrants committing crimes. He basically said it's not helpful at all. That everyone working in Congress is a fine human being, they all get along with each other and this kind of labeling of someone with a different opinion as evil is ridiculous and has just got to stop. That he's going to ignore that kind of thing from now on....Etc. Edit to add: I think the "putting screws to the House" is partly going to be "get them to act more Senatorial." Which, admittedly, has not been easy over it's history! But temporarily, I suspect what's going on is that party leaders are asking their caucuses to tamp things down for a while, stop the artificial crises making that is very much instigated by Trump controlling the national rhetoric. Barrett used exactly this kind of language, he was talking about tamping down the angry rhetoric. He was talking about being more collegial. I am as cynical about that as anyone else, it is likely to be temporary, of course. But something is better than nothing. And I think you are still going to see partisan attacks, but they are going to be about actual policy positions, not according to Trump's artificial narratives. Precisely because they want voters/constituents to actually know where they stand on issues, not according to the Trumpian meme du jour that may or may not even make sense. It's a pretty smart piece by Rubin. I appreciate her much more in her new Trump-hater incarnation than I did in her old fact-proof Romney loyalist phase. This is about putting the screws to the House. The Senate, if possible, will pass a bill and then, as they like to say, “jam” the House. The bill and possibly continued funding will then rest with the House. Whether House Speaker Paul D. Ryan (R-Wis.) has the nerve to bring a DACA bill to the floor (and actually act on his sympathetic rhetoric!) is a big open question. Making House Republicans the bad guys on this may help Democrats’ chances in the midterm elections, but the path to putting an actual bill on the president’s desk is murky at best. As former Department of Justice spokesman Matthew Miller tweeted, “I don’t think people analyzing the politics of this have considered how bad the situation will be for the GOP if the Senate passes a DACA bill, the House doesn’t, and deportations start in the months before the midterms.” Perhaps. NCD, you're so good at imitating him, got any ideas of how he might take to spinning the current situation of the bill, i.e., how he singlehandedly got the government open again and got them to send him the bill he is now signing? NEXT UP: off to Davos to show how he's got the yugest most brilliant brain in the whole world? he's thinking about letting them "morph", possibly just so he can publicly embarrass his minions (Opposition Defiance Disorder**)? WASHINGTON — President Trump on Wednesday said that he is open to a possible path to citizenship after 10 to 12 years for hundreds of thousands of undocumented immigrants brought to the United States as children, days after rejecting a bipartisan plan with that as its centerpiece. Mr. Trump once again seemed to undercut his administration’s message, telling reporters at the White House that he would allow the young illegal immigrants to “morph into” citizens over a period of time. ** purported to be a common Trump staff diagnosis of their bossman according to both Howard Kurtz's new book and the Times' Maggie Haberman. On the other hand, it could also be something like he just became enamored of a tweet he just ran across or some Fox News pundit that just broadcast exactly the right talking points, turned on the switch....Whatever the case, increasingly it just seems we have a spoiled bratty child president. There was just a clip I heard where he truly sounded like a terrible two having a temper tantrum. I wouldn't be surprised if he starts bragging to the snobs who look down on him at Davos how he's going to MAGA by accepting all these great hardworking DAGA kids as citizens. On the issue of whether the impromptu presser was defiance disorder against John Kelly by Haberman yesterday @ NYTimes Basically just sorting through the gossip and infighting; interesting if you're into that sort of thing, i.e. some have put out that Ivanka dislikes Kelly, but then countering that Ms. Trump has also complained to colleagues that people try to use her as a cudgel against Mr. Kelly, imparting a level of anger at him that she says she herself does not feel.